A dark and mysterious version of Valkyrie has appeared, and she has begun creating shadowy clones of DDR girls. Evenly-matched girls must compete against their mirror images for either Team Light Valkyries or Team Dark Valkyries. Which side will prevail??? Defeating your ‘mirror’ will earn points for your team. Even if you are not a top-tier player, you have just as much opportunity to contribute to the team as the best players do! Each player is just as important as the rest. Team up together to bring victory to your team! 6. The team with the highest combined score wins! Unlike other Valkyrie Dimension Events, you must pre-register for this one. Please play at least 2 of these song choices, preferably all 3! If you are certain you can’t even put a dent into that 16, you don’t have to do it. Failing scores count and are important in determining an appropriate opponent for you! YOU DO NOT NEED TO PLAY THEM IN A SINGLE SET! The ‘light’ and ‘dark’ sides will compete against their rivals to earn points for their team over a 4 week period. You may submit scores as many times as you’d like. • You will be matched up with a “mirror” version of yourself. • This will be the person closest to you in skill level that also enters. 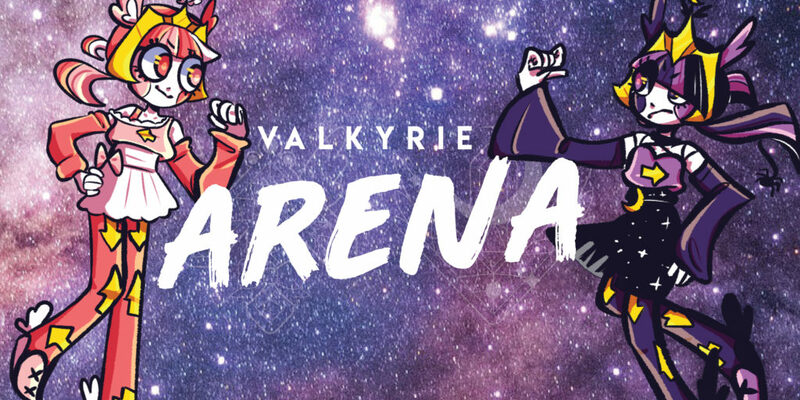 • Rivals will be curated by Valkyrie Dimension staff. • You will be randomly put on either the “light” or “dark” team. • Your “mirror” will be on the opposite team. • No, you cannot request a team or switch sides with your opponent. Sorry! • You and your rival will get two unique sets of songs. • The first set will be revealed at the beginning of the event. • The first set of songs will consist of 1 song chosen by you, 1 by your opponent, and 1 random chart picked by card draw. • The song you select against your opponent for Set A still must present a challenge for you to score well on! Valkyrie Dimension staff may reach out to you to request a different song choice if they feel it may not be significantly challenging enough, or if it is an unlock. • The second set will be revealed at the start of week 3. • The second set will be ALL random card draws. • You can still submit scores for the first set of songs after the second set has been revealed. • You do not need to play the songs as a set. • You can play them as many times as you’d like in the time period given. • You must take a clear photo of the EX score with your DDR name visible. The main objective is to beat your opponent in the 6 songs, but you can also gain bonus points depending on how well you do. You are earning points for your team’s total. Can I switch teams or rivals? Nope! Sorry but we want to make the teams and pairs as balanced as possible. We can’t make it perfect, but we will do our best. Switching sides or pairs will unbalance things. Can I submit another score for the same song if I play it again and improve it? Yes! You can submit songs as many times as you’d like to. How do I get the bonus for submitting early? 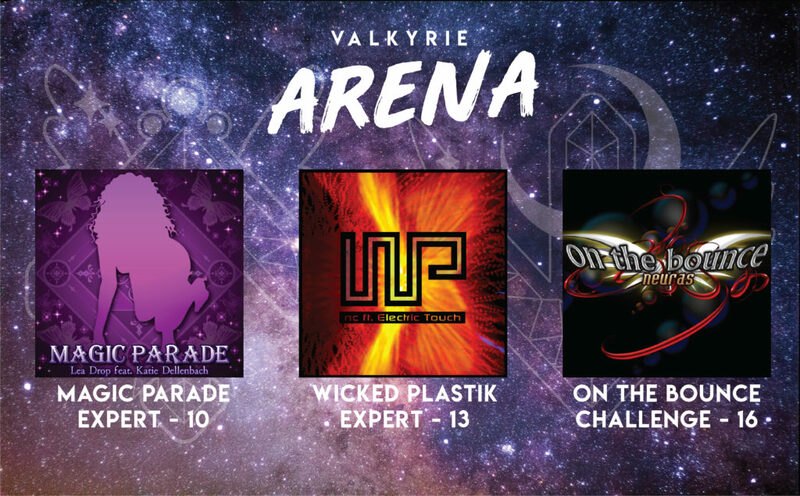 Email your scores to ValkyrieDDR@gmail.com in the first week the sets are announced. You must submit all 3 songs to get the bonus. Do I have to play the songs as a set in the same game? If I submit a score early enough to get a bonus point, then submit another score later, does that bonus point go away? No. As long as you submit any score within the bonus period, you will get the point even if you submit again later! How do I find out who my rival is and what songs to play? Am I good enough to enter this? Yes! No matter what skill level you are, you can participate. You will be matched with the closest person to your skill level. Even if you can’t beat your opponent, you can still earn points for your team in other ways. What do I get if my team wins?